Blues singer and harmonica player Sonny Boy Williamson II performed originally during the 1930s and ‘40s as Aleck or Alex Miller, Rice Miller and Little Boy Blue before adopting the name of earlier blues artist Sonny Boy Williamson, born around the same time but who died in 1948 – during the 1940s they were both using the name. For the same of avoiding confusion, it’s easier to refer to the artist who is the subject of this collection using the “Sonny Boy Williamson II” nomenclature. Like many blues performers, he came from Mississippi, but built his reputation on radio in West Memphis, Arkansas, in the late ‘40s, during which time he married Howlin’ Wolf’s sister and taught him to play harmonica. Between 1951 and 1955 he released twenty-five titles on the Trumpet and Ace labels, and when Trumpet went bankrupt in 1955, and was acquired by Chess, he continued recording for the Chess subsidiary Checker label through into the ‘60s, becoming one of the US bluesmen who toured Europe during the ‘60s blues boom and influenced many future rock performers. 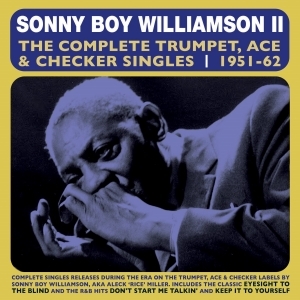 This great value 51-track 2-CD set comprises all his recordings released during this period on Trumpet, Ace and Checker, and includes the classic “Eyesight To The Blind” along with along with the Elmore James version of “Dust My Broom”, and the R&B hits “Don't Start Me Talkin'” and “Keep It to Yourself”. It encapsulates his recordings during a key period of his career, and is an excellent showcase for his distinctive style as a blues singer, songwriter and harmonica player.